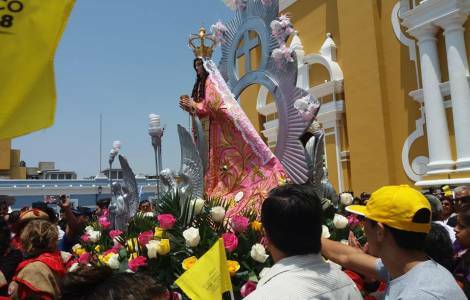 Trujillo (Agenzia Fides) – On Sunday, January 20, the first anniversary of the Pope's pastoral visit was celebrated with a solemn mass and the coronation of the image of the "Immaculate Virgin of the Door", in Otuzco, in the district of Salaverry. The information sent to Fides by Father Raymundo Claudio Delgado, Vicar General of the Archdiocese of Trujillo, highlights this important liturgical celebration held in the Cathedral Basilica of Trujillo, with the participation of the Archbishop of Trujillo and president of the Episcopal Conference of Peru, Mgr. Miguel Cabrejos Vidarte OFM. "Our Archdiocese wishes to joyfully celebrate this first anniversary of the historic visit of the Holy Father and the coronation of the Immaculate Virgin of the Door in Otuzco, and we invite all the faithful to participate with great joy in this first anniversary of the Holy Father’s visit", said Father Delgado to Fides two days ago. The Pope’s visit in Peru marked the participation of the Catholic Church in the political and social life of the country. During the meeting with the Bishops of Peru, a year ago in Lima, the Holy Father asked: "What happens in Peru when a president ends his mandate, is he sent to jail?". The Episcopal Conference responded the following March with a very articulate declaration in which we read: "We see a systematic process of corruption caused by the divorce between ethics and politics, reinforced by personal and group ambitions, exacerbated by impunity and mistreated by a system that ignores justice. We have reached a point of political break: a new beginning requires not only a change of command but also the ethical and moral recovery of the country at all levels, because high levels of corruption steal hope, especially for the poor and the young".